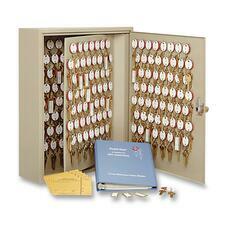 Wall cabinet is designed to utilize permanent pattern key tags and duplicate key tags on the same hook. 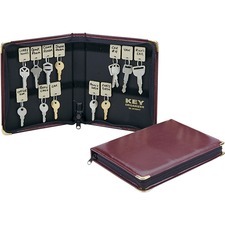 System includes key tags, brass receipt holders, key-collection envelopes and cross-reference index system in three-ring binders. Wall cabinet features a lock and two keys. 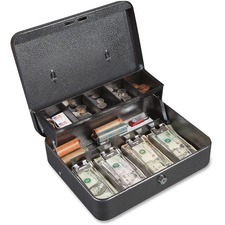 Locking cash box offers a great way to secure your cash and coins. Five-compartment plastic tray lifts out when you open the hinged lid to store and organize your coins. Store your cash bills in the four spring-loaded money clips built into the bottom of the box. Stop hinge design keeps unauthorized eyes from observing cash. Interior height is 3-7/8". Box is made of heavy-gauge steel with Silver Vein textured, powder-coat finish for durability. Use the convenient, plastic carry handle built into the top to transport the box. Locking box also includes two keys for the keylock. 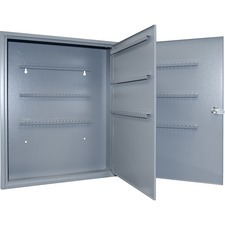 Key cabinet features a hook design, 240-key capacity and all-steel construction. Secure with keylock. Key cabinet includes plastic key tags and hardware for mounting. 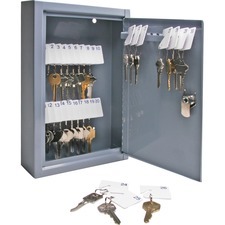 10-key steel cabinet keeps track of your "loaner" keys and organizes your business. Ideal for offices, rental management companies, and truck and auto rental companies. Simply attach keys to the numbered key tags (included) and file on the key racks slots. When a key is loaned, an "Out Key" control tag (recording the key number, key recipient and date) is filled out and placed in the same spot as the loaned key. For additional accountability, a record chart can also be filled out. SteelMaster UniTag Key Cabinet is made of durable heavy-gauge steel with a chip-resistant and scratch-resistant pearl finish. Full-length piano hinge allows you to open the cabinet fully and view all keys. A door-mounted, single keylock secures the cabinet. Predrilled holes and mounting hardware allow easy installation. Locking door includes standard disc tumble keylock with two keys. 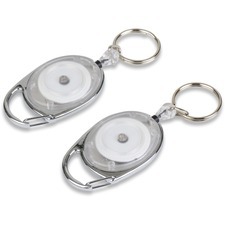 Reel key chain features a chrome-plated carabiner with transparent cover clips. Easily secure around belt loops, bags or purse straps. Attached split ring holds keys. Cord extends 30" and retracts as needed. 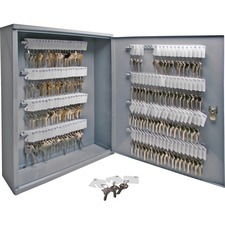 Key cabinet features a hook design, 160-key capacity and all-steel construction. Secure with keylock. Key cabinet includes plastic key tags and hardware for mounting. 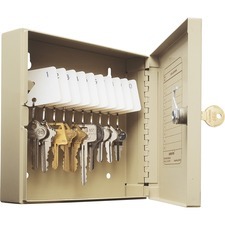 Key cabinet features a hook design, 30-key capacity and all-steel construction. Secure with keylock. Key cabinet includes plastic key tags and hardware for mounting. White plastic key tags are perfect for offices, rental management companies and storage facilities. 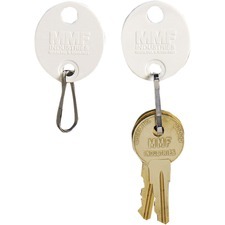 Sturdy, 1-1/4" high, plastic key tags with write-on surface are attached to chrome-plated key holders and are designed to work with the SteelMaster Dupli-Key System that uses two different sets of numbered key tags and makes managing keys as efficient as possible. Simply attach your master key to the red octagonal-shaped, self-locking key tags (sold separately) to ensure your master original key is never loaned. Fasten the duplicate loaner key to these white, oval, snap-hook key rings and file on the same hook with the master key. Tags can be used alone. The write-on surface makes it easy to label or identify the key's purpose. The hooks accommodate one or more keys.